1. 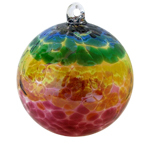 Rainbow Dancer - A spectrum of colors found in ranbow adorns this ball. 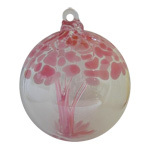 Hang it in the window or anywhere where you can view its calming and uplifting beauty. Available in 4" and 6". 2. Wish keeper - Make a wish and visualize it comming true. It will help creat it in your own life. Available in 4" and 6". 3. Tree of Hope - The Tree of Hope radiates hope and resilience. It makes a thoughtful gift for a loved one courage. Available in 4" and 6". 4. 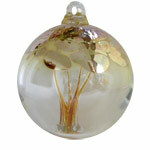 Tree of Knowledge - This Tree of Knowledge Ball is handcrafted with precious 24 karat gold. Ideal for the student, teacher, seeker. Available in 4" and 6". 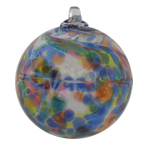 GRTOK - Tree of Knowledge 4 or 6"